After the successful unveiling of the Ducati Scrambler at Intermot and stealing the spotlight at the EICMA international motorcycle in Milan, It was the turn of Motorcycle Live to experience the “Land of Joy”. In a dedicated area, located near to the Ducati stand, the distinctive yellow containers drew visitors in droves on the first days of the show at the National Exhibition Centre in Birmingham. Deck chairs, tables and parasols all branded with the now familiar Scrambler Ducati logo added to an informal and relaxed atmosphere. Visitors were naturally drawn to this world taking plenty of time to explore the range of four models and viewing the extensive Ducati Scrambler clothing collection and accessories. The accessories and clothing that will be available mean the Ducati Scrambler can offer almost infinite options in terms of both personalisation and the exclusivity. Casual, outdoor and authentic, the Ducati Scrambler clothing collection highlights free expression, adopting the same philosophy as the bike and modernising the heritage style of years gone by. This style is known as “post-heritage”, which means taking the best of the past to create something unique and absolutely contemporary. The clothing concept stems from this, not only as “equipment for motorcyclists” but as a real lifestyle, breaking down barriers between technical garments and fashion. The Ducati Scrambler is available in four versions - The Icon, (available in yellow and red) Urban Enduro, Full Throttle and Classic - each offering its own style and performance-related interpretation of the Scrambler spirit. The Urban Enduro, with its “Wild Green” paintjob, is for enduro style enthusiasts and ready to switch from city streets to country backroads in an instant. The Full Throttle is for riders enthralled by the flat-track racing world who have a penchant for pushing things to the limit. And the Classic is for devotees to details and a 1970s look who want the uncompromising riding pleasure and comfort of a modern-day bike. The four versions of the Ducati Scrambler are on display in Hall 3, stand E10 at Motorcycle Live until November 30 and will be in UK Ducati Dealerships starting from February 2015. 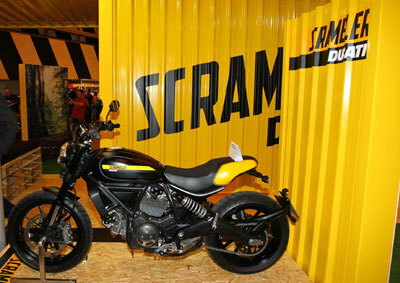 For information on the Ducati Scrambler range visit scramblerducati.com.